Details of the skeletal samples, measurements, and some of the statistical analyses have been reported previously in Lemelin (1996, 1999). For the purpose of this chapter, the methods and some of the results of these analyses are summarized, in addition to new morphometric results. Five didelphid taxa (Monodelphis domestica, Philander opossum, Didelphis virginiana, Marmosa robinsoni, and Caluromys philander) and three cheirogaleid taxa (Microcebus murinus, Cheirogaleus medius, and Cheirogaleus major) were considered. The sample sizes are indicated in Figures 3 and 4. 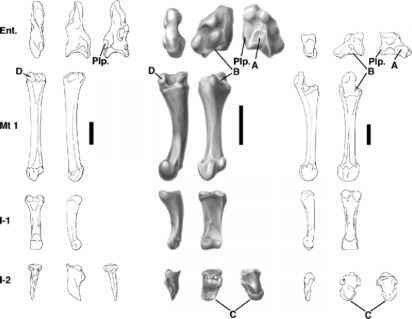 The length of each metapodial (M), proximal phalanx (PP), and middle phalanx (MP) was measured on the hands and feet of museum specimens (skeletal specimens or radiographs of pelts). A phalangeal index was computed in order to estimate the degree of pre-hensility of each ray (I-V) (Napier and Napier, 1967; Napier, 1993). For the first ray of the hand and foot, this index is equal to the length of the PP divided by the corresponding M times 100. For all other rays, the same index is equal to the sum of the PP and MP divided by the corresponding M times 100. Monodelphis brevicaudata, (2) Philander opossum, (3) Didelphis virginiana, (4) Marmoset robinsoni, (5) Caluromys philander, (6) Microcebus murinus, (7) Cheirogaleus medius, and (8) Cheirogaleus major. Figure 4. Box-plot graphs of the phalangeal indices for rays I through V of the foot in didelphids and cheirogaleids. The diamonds represent the mean, the vertical line the median, the left and right sides of the rectangle the 25th and 75th percentiles, and the left and right ends of the horizontal line the 10th and the 90th percentiles. The shaded rectangles represent taxa that move and forage primarily on thin branches and open rectangles that move and forage primarily on large arboreal substrates and/or the ground. (1) Monodelphis brevicaudata, (2) Philander opossum, (3) Didelphis virginiana, (4) Marmosa robinsoni, (5) Caluromys philander, (6) Microcebus murinus, (7) Cheirogaleus médius, and (8) Cheirogaleus major. feet. The link between arboreal foraging on thin supports and more grasping extremities is reinforced when didelphids are compared to primates. The means and distributions of most phalangeal indices of Marmosa and Caluromys fall closer to or within the range of those of cheirogaleids (Figures 3 and 4). Several additional patterns are also worth mentioning. First, it is important to note that the clawless distal phalanx of cheirogaleids (which contributes to about 20% of total thumb length) was not included in the computation of the phalangeal index, explaining why the cheirogaleid distributions of manual ray I fall within those of more terrestrial didelphids (Figure 3). Second, the lack of clear differentiation for the hallux within didelphids, and between didel-phids and cheirogaleids (Figure 4) suggests that some climbing abilities have been retained in the foot of more terrestrial didelphids (see following section) and that all didelphids can be derived from an ancestor with a divergent, grasping hallux capable of arboreal locomotion such as climbing (Bensley, 1901a,b; Dollo, 1899; Huxley, 1880; Szalay, 1984, 1994). Finally, the hands and feet of didelphids are characterized by a monotonic increase in the values of the phalangeal indices from ray I through V, whereas those of cheirogaleids show an increase from ray I through IV, then a decrease for ray V (Figures 3 and 4). These proportional differences are not surprising considering the wide gap in phylogenetic heritage between these two distantly related groups, and may underlie two slightly different grasping mechanisms. Overall similarity of hand and foot morphology among didelphids and cheirogaleids can be summarized using clustering methods (Sneath and Sokal, 1973). Standardized mean values of phalangeal indices were used to compute average taxonomic distances among taxa. The resulting matrix (8 x 8) was summarized using four different clustering algorithms found in NTSYS v. 2.02 (Exeter Software, Setauket, NY): (a) unweighted pair-group method using arithmetic average (UPGMA), (b) weighted pair-group method using arithmetic average (WPGMA), (c) single-link (nearest neighbor) method, and (4) complete-link (furthest neighbor) method (Manly, 1986; Pimentel, 1979). All four methods pointed to a similar clustering pattern: both groups of fine-branch arborealists cluster together, Marmosa and Caluromys with cheirogaleids, separately from another group comprising all three more terrestrial didelphid taxa (Figure 5). This similarity in overall proportions of the hands and feet, which are likely to reflect similar grasping abilities between taxa with radically different phylogenetic backgrounds, strengthens the case for functional convergence in response to similar ecological niches. Figure 5. Phenogram of UPGMA clustering (rcoph = 0.94) based on average taxo-nomic distance matrix of all manual and pedal phalangeal indices in didelphids and cheirogaleids. Note the grouping of Marmosa and Caluromys with cheirogaleids in a cluster separate from more terrestrial didelphids. The cophenetic correlation coefficient (rcoph) measures the goodness of fit between the original distance matrix and that resulting from the clustering algorithm. Nevertheless, it is important to note that the clustering within the fine-branch arborealists also points to a phylogenetic signal (i.e., the two didelphids and three cheirogaleids cluster within their own families), which may be linked to those gradient differences reported above in the values of the phalangeal indices between didelphids and cheirogaleids. Opossums and primates that spend more time on thin arboreal supports are also characterized by similar intrinsic ray proportions of the hand and foot compared to more terrestrial opossums. The digital portion (i.e., proximal and middle phalanges) of Marmosa, Caluromys, and all three cheirogaleids always contributes to 50% or more of total ray length. In Monodelphis, Didelphis, and Philander, the metapodials always contribute to 50% or more of total ray length, with the exception of ray V (Figures 6 and 7). For all rays of the hand and foot, the relative contribution of the digit portion in total ray length is always greater in fine-branch arborealists compared to more ground-dwelling taxa. As reported by Hamrick (2001), longer proximal phalanges relative to the metapodials appear very early in life in Microcebus and Caluromys and are conserved throughout ontogeny. This pattern, found in primates and woolly opossums, is different from that of bats, tree shrews, flying lemurs, as well as plesiadapiforms (Hamrick, 2001).